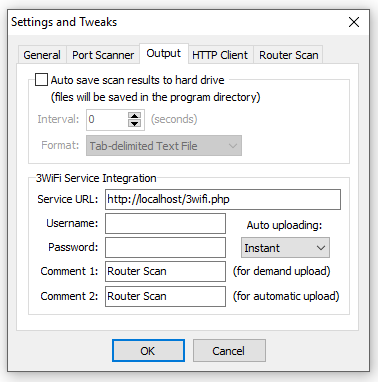 Router Scan program scans the networks and collects information about the routers, including the passwords for Wi-Fi networks. To find out the password from the neighboring Wi-Fi, you need to scan the entire IP range of your neighbor's Internet provider. If you do not know what is neighbor’s Internet service provider, you need to scan the IP range of your region (state). This needs much time, but the result is not guaranteed, because the neighbor router can be protected well and even if you scan it, you will not be able to find out the password; It can also be behind NAT (a technology that allows one IP to be used by several users at once) in this case we can not even scan its router. Usage of 3WiFi is free of any charge. In order to see passwords of Access Points you must log on to the site. For this, you do not need to register. In addition, you can use wildcard characters. The asterisk (*) replaces any character and can stand anywhere in the search string. Advantages of searching by BSSID (MAC address) is that usually devices have a unique BSSID, therefore and you will find exactly the access point that you are interested in. Not everyone knows how to recognize BSSID from neighboring Wi-Fi (although it can be done directly in Windows with WirelessNetView and in Linux with numerous programs, for example, Airodump-ng), so you can search for it by the network name (ESSID). As you can see, the case of letters is not important. You can also search for access points using the Wi-Fi password (the network key) and the WPS PIN code; this can be useful for research purposes. This tool allows you to search IP ranges by the physical (geographical) location. The comparison is based on the collected data from the geolocation providers. This is a very useful tool for network researchers who want to scan IP over certain geographical coordinates. 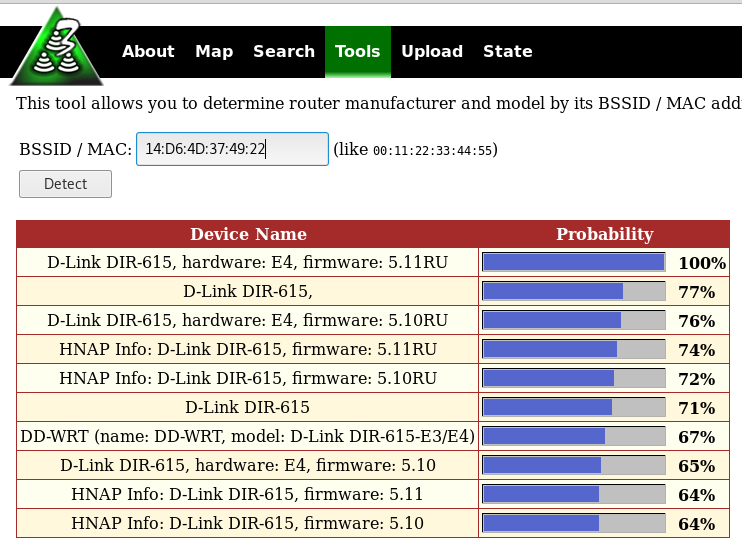 This tool allows you to determine router manufacturer and model by its BSSID / MAC address. The comparison is based on the data collected by Router Scan. Note that unlike many similar services (like this), not just information about the manufacturer is displayed, detailed information about the model is displayed, and there is probabilistic information about the firmware of devices. A very useful tool if you want to connect to Wi-Fi when you do not know the password from this network, but the access point supports WPS. This service will help you guess the WPS pin based on the MAC address of the AP. 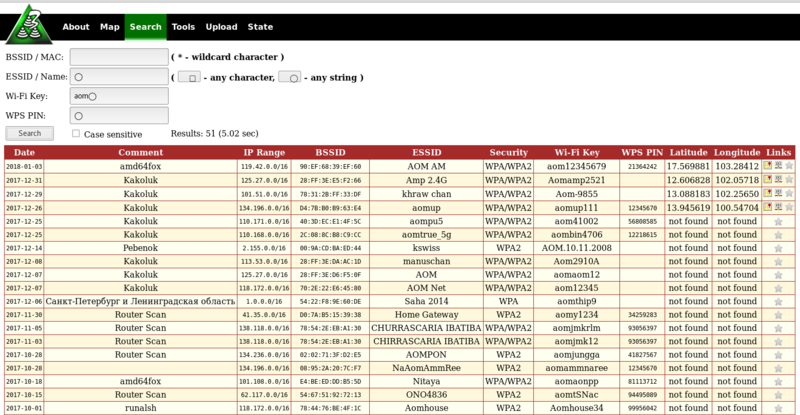 Offline WPS PIN Companion from Router Scan (Uses known algorithms, does not use database). Online 3WiFi WPS PIN generator (Takes advantage of collected data in the database, detects linear sequences, static PIN codes, and other algorithms). You cannot download the 3WiFi database. Attempts to pump out the database will lead to the ban of your account and the ban of all invited by you and further along the chain. No merit will not remove the ban. Therefore, you need a web server, and you also have to scan the ranges you need to have your search information in your 3WiFi database. Before running the daemons, make sure that php-cli interpreter is accessible from your directory. 3WiFi is a free database of access points (open source under the Apache 2.0 license) developed by the Router Scan community with the participation of Stas'M Corp. It stores the access point data that was received as a result scans performed by Router Scan. All data is downloaded to the database voluntarily - either through the website, or directly from Router Scan. 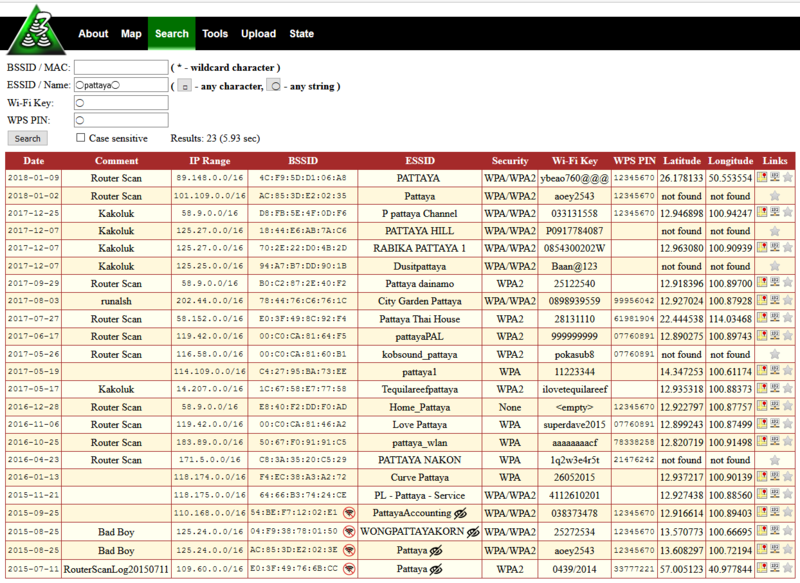 The 3WiFi database is used by the Router Scan community to search for access points, to investigate new vulnerabilities in wireless routers, to detect previously unknown WPS pin-code generation algorithms, to detect routers' mass destruction hotspots (such as substituting SSID name, DNS servers, etc.) , and for many other purposes. Also 3WiFi base is used by Stas'M Corp. for monitoring, detecting and correcting errors and inaccuracies in real-time scanning results.